Lock in a great price for Bungalows Korana - Campsite Korana – rated 8.5 by recent guests! Great location when you want to hit the park early. Very quiet campsite. Cute little cottages. Great value, but sparse accommodation and not much to do in campground. Breakfast was excellent, dinner was meh. Horrible WiFi, never managed to connect. The open area of the property and closeness to thePark. The price for a bungalow was good and the scenery around the property was beautiful. Very nice breakfast buffet included in the bungalow prices. Free shuttle bus to Plitvice Lakes in the morning. Basic bungalow with comfortable beds. Beds were comfy and breakfast was great with lots to choose from. 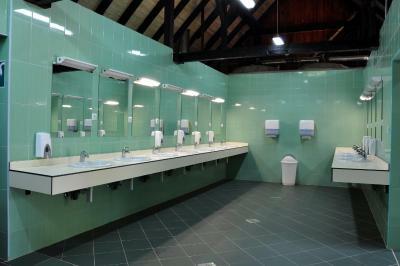 Very clean bathroom and bungalow. Not too far from the lakes if you have a car. Very good looking, bungalows are comfy, they have everything you need, market, caffe bar, restaurant, ATM. Friendly staff, helped us with useful info. Clean and close to park. Breakfast also a bonus if staying in bungalows. Bungalows Korana - Campsite Korana This rating is a reflection of how the property compares to the industry standard when it comes to price, facilities and services available. It's based on a self-evaluation by the property. Use this rating to help choose your stay! Bungalows Korana offers 35 hectares of spacious campground located 5 mi north of UNESCO’s World Heritage site, Plitvice Lakes National Park. 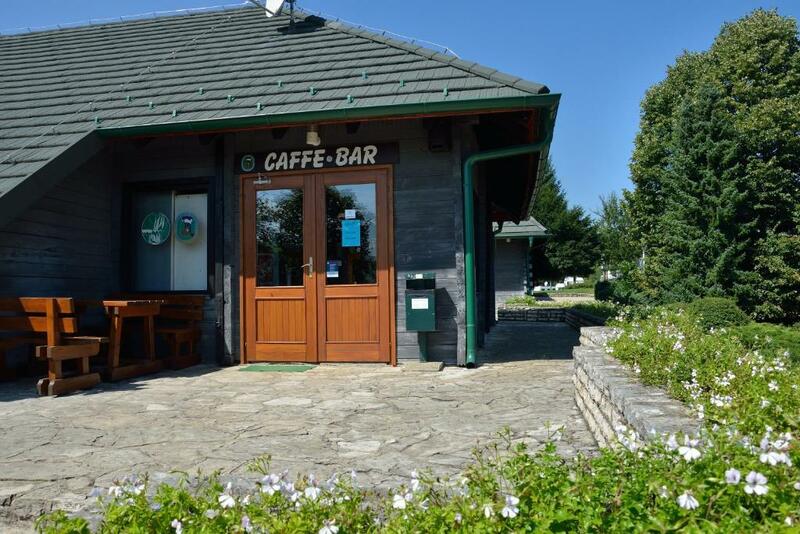 The campground offers a buffet and an à la carte restaurant with a summer terrace, a bar and a shop. Free Wi-Fi and parking is provided. The units are located in picturesque wooden bungalows furnished with two beds, a table and chairs. A shared bathroom with showers and washing machines is at the guests' disposal. An outside grill restaurant offers guests a variety of barbecue dishes. A free local bus line can be found on site, leading to and from the National Park once a day. The campground stretches over the plateau overlooking the Korana River. It is an ideal place for walking with a promenade leading above the river canyon to Drežnik Old Town, jogging and cycling with numerous interesting spots to visit in its surroundings. There is a free shuttle bus that takes the guests to Plitvice Lakes. When would you like to stay at Bungalows Korana - Campsite Korana? Made of wood, this room features a shared bathroom. The room has two single beds that can be pushed together. House Rules Bungalows Korana - Campsite Korana takes special requests – add in the next step! Bungalows Korana - Campsite Korana accepts these cards and reserves the right to temporarily hold an amount prior to arrival. The place is super nice, it looks like a golf field ! Toilets and shower are clean and the food is good. Bungalows had no heating or air conditioning!!! It was absolutely freezing during my stay at night. Market onsite but quite expensive and limited stock...only other option is restaurant. Bathroom shower heads were not attached and you had to hold it to shower which was very inconvenient!!! Wifi did not reach the bungalows! It was only available at the reception areas. GREAT location and super easy to get to and from Plitvice Lakes (they supply a complementary shuttle bus to transport all the guests everyday!) decent breakfast, bathrooms clean, nice to walk around the campsite. Staff super helpful and lovely!!! Probably it was not a good idea to stay in camping in mid October - there was no heating in the bungalow or bathroom therefore it was cold. Only one power outlet. Nice territory. Restaurant. Great breakfest. Free parking. The bungalow was very cold. The breakfast are delicious and the toilet are very clean. Nothing-we liked it all! Just finding it was not that simple!You need to drive quite a bit further when you see Korana first mentioned and wait for sign Autocamp Korana on right hand side of road approaching from Zadar. Check in was so easy and helpful.They give a site map with times of opening etc. The bungalow was cosy and as the weather temperature dropped dramatically and we only had summer clothing,it was possible to stay warm in the bungalow with a thick blanket per bed as well as a duvet. We were particularly impressed with the service in the restaurant-it was really good&the food too.We did not even consider eating off site! We were there end of season and we liked the beauty and the quiet.The free transport to and from Plitvice National Park was a real bonus and we made use of it both days. Just if we must find something, they accepted payment in Euro, but did non have the change. An incredibly extended space in nature for tends, a lot of camper spaces and very nice bungalows, baths always clean and beautiful common spaces with a great breakfast. The restaurant seemed really good too and there are a bar and a little market too. Very nice to visit the Plitvička Jezera national park and be part of the nature. The furniture could be updated in the bungalows, especially the beds. Some better directions around the property could be of help. I got lost at night, walking from the restaurant on-site back to the bungalow. Separately, my girlfriend got lost as well and I had to share my GPS location to find eachother. We enjoyed this "adventure", but I imagine this can be inconvenient. The property area is huge and I find it very easy to get lost at night, if you are there for the first time. We enjoyed our stay at the bungalows. The property is surrounded by trees and green fields, it's a great place to camp in as well. Breakfast was plentiful and delicious, the croissants were amazing, so was the coffee. Bungalows are cozy, but don't expect luxury or anything fancy. They are good for a young couple, looking for a nice, rustic and cozy accommodation. What I liked most about this location, is that it's close to Plitvica Jezera lakes, allowing us to get there fast. The property area is huge. I feel like the room wasn't "ready" for us, but it was comfortable. We had twin beds, a table and a drawer. The camp is very well equipped for those who like camping and is very big, well organised with communal bathrooms which are very clean, by the way. There are a restaurant, a terrace and a supermarket inside the camp. The place is very close to plitvice lakes entrance 1. We stayed one night. The breakfast was awesome and delicious, with good coffee and a lot of food. The carbin is super small. Two single beds, a small closest with a small table. There is no extra space. Our door has problem, the door can't be locked from inside. The staff is super nice. I forget the charger in room and she find us to give my thing back. Share toilets and showers are clean. There are people always clean it. Breakfast is great. Nice relaxing place after visit the park.